Tom Norman took three wickets for Nassington at Saffron Walden. 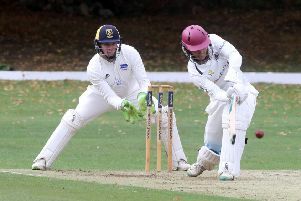 March Town clinched an immediate return to Cambs Division One for next season even though their big game at St Ives was abandoned just after half-time yesterday (September 3). March, relegated last season, collected enough bonus points by bowling Division Two table-toppers St Ives out for 124 to secure second spot, but they also moved to within one point of their rivals with one play. Jack Hargreaves cracked 48 not out from 25 balls for Wisbech at Blunham. March travel to struggling Fordham next Saturday (September 10) when St Ives host neighbours Warboys. a team who still need points to make sure of avoiding relegation. Tommy Howgego (4-14), Andrew Wright (3-24) and Sam Freedman (2-25) were the March bowling stars yesterday. Newborough need points and a miracle to avoid a return to the Hunts League after a poor day in Huntingdon yesterday. The Bulls had won two in a row to set up a potential ‘great escape’ but Huntingdon racked up 220-5 in their 50 overs yesterday before restricting Newborough to 42-2 in nine overs before play was abandoned. Sam Freedman (left) was among the wickets for March in St Ives. Newborough are now 21 points from safety (it is possible to pick up 24 in one game) with just a home game with Ufford Park to go. Ufford managed just a handful of overs yesterday and the same fate befell Ramsey and Ketton at Cricketfield Lane in Division One. There was more action at Blunham and Saffron Walden, but not enough to secure a positive result for Wisbech and Nassington respectively. Blunham recovered from 78-5 to post 239 against Wisbech, but the Fenman were rattling along in reply at 94-2 in just 12 and a half overs before the rain arrived. Aussie Jack Hargreaves was unbeaten on 48 from just 25 balls, an innings that included seven fours and two sixes. Sam Rippington had earlier taken 4-38 for Wisbech with Gary Freear chipping in with 3-57. Saffron Walden totalled 254-8 in their 50 overs against Nassington, but the weather stopped the visitors starting a reply. Tom Norman and Harrison Craig each took three wickets for Nassington. Castor will be playing in Cambs Division Two next season after sealing the Hunts Division One title without bowling a ball yesterday. Castor’s match with leaders Ramsey seconds was washed out, and because Godmanchester seconds have already conceded next week’s scheduled fixture with Castor, the villagers will leapfrog Ramsey into first place. Ramsey have no more fixtures remaining. They will now go into a play-off for a Cambs League place. Blunham 239 (S. Hussain 82, R. Adams 50, S. Rippington 4-38, G. Freear 3-57, P. Edgeller 2-33). Wisbech 94-2 (12.3 overs) (J. Hargreaves 48no, G. Freear 20). Saffron Walden 254-8 (A. Russell 71, J. Hayes 51, H. Craig 3-44, T. Norman 3-50). Huntingdon 220-5 (F. Javed 65, D. Jamal 51, M. Zamir 36, M. Khan 30, G. Rowland 3-30). Newborough 42-2 (9 overs) (U. Khan 2-23). St Ives 124 (T. McCarthy 56, T.Howgego 4-14, A. Wright 3-24, S. Freedman 2-25).